During the week between the Elite 8 and the Final 4, the announcer perhaps still most associated with March Madness will be broadcasting a soccer game from Manchester, England. 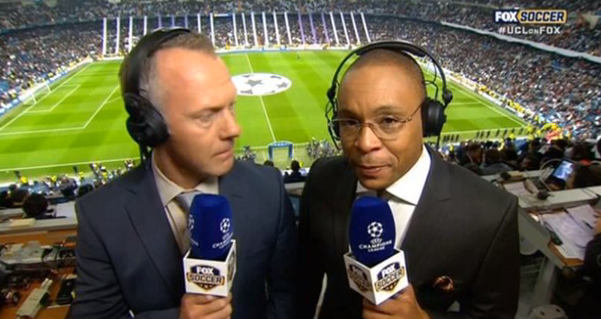 On April 1st, Gus Johnson begins his second season as a Fox soccer announcer when he returns to Europe to call the Champions League quarterfinal between Manchester United and Bayern Munich. It’s been three years since Johnson announced NCAA Tournament games, but his presence is still missed by college basketball fans. In moving on from the event that made him a cult favorite nationwide, Johnson and Fox Sports have taken one of the biggest gambles in sports broadcasting by transforming him into the network’s lead soccer announcer. Johnson’s move to soccer has been heavily scrutinized, perhaps more so than any single announcing assignment in sports. When he began the journey during the Champions League last season his experience had only consisted of calling a few MLS games on radio. To go from there directly to the Champions League is like making the jump from the NAIA to Division I. In placing Johnson on its soccer coverage, Fox went in a bold, yet different direction than ESPN (and later NBC) who hired several of the best British broadcasters like Ian Darke, Martin Tyler, Arlo White, and Rebecca Lowe to lead their global soccer coverage. ESPN and NBC’s coverage has been lauded for its quality and maturity, finally presenting soccer to soccer fans as a real sport and not some kind of foreign curiosity. Stepping away from that strategy, and doing so with someone with such little experience broadcasting soccer, is a huge gamble. Anointing Johnson as their lead voice as they take over World Cup coverage from ESPN beginning in 2015 is the ultimate risk-reward proposition. Having a mainstream American voice call the game is an important step forward for televised soccer in the states in the long term. However, since Johnson is not the quality of Martin Tyler and Ian Darke, Fox risks alienating and losing fans by offering a subpar product in the short term. Fox faces a ton of pressure to live up to the high standards set by ESPN for the 2015 Women’s World Cup from Canada. While Gus definitely experienced growing pains, he did get better as the European season progressed. His first soccer moment came during the FA Cup Final where he exploded for Wigan’s upset victory in typical Gusgasm fashion. But perhaps the most important work Gus Johnson did last year was after the European season ended during the summer’s Gold Cup. Here Johnson gained valuable reps and also finally found a consistent partner in Eric Wynalda, who will join him at Old Trafford. Johnson seemed more at home calling the US National Team games as seen in this clip of an Eddie Johnson goal. Johnson showed improvement during the Gold Cup compared to his performance during the Champions League. He will always stand up for the big moments in a match, but will he be able to better tell the story of the game while the ball is being passed around the midfield? Will he improve in player identification? Will his play by play sound more fluid and natural or will it still be sudden bursts of emotion surrounding languid prose? These are the questions Johnson and Fox must answer in Year 2. This will be the European campaign that defines Gus Johnson in the eyes of soccer fans. Now that he has a year under his belt, viewers at home will expect much better. No more can Johnson and Fox lean on his rookie status – this is the year that fans on the fence will make their decision about Gus Johnson as a soccer announcer. If Johnson does not make significant improvement in 2014 and continue the strides made in the summer, Fox may be tempted to look elsewhere for a new lead announcer (perhaps even to Ian Darke) as their World Cup coverage begins in 2015. This is the year that Gus Johnson will either stay up and remain in the top flight of soccer announcers or face the threat of relegation.